There are hundreds of different types of discs designed for a specific purpose and flight path. Varying terrain, vegetation, elevation, and aerial obstacles add to the mental challenge that makes playing disc golf enjoyable for everyone. 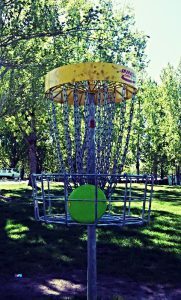 Why Should You Consider Installing a Disc Golf Course? These reasons are why disc golf is one of the fastest growing sports in the United States. 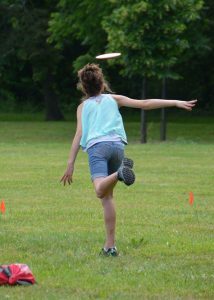 Disc golf is a relatively young sport that is adding hundreds of new courses every year. 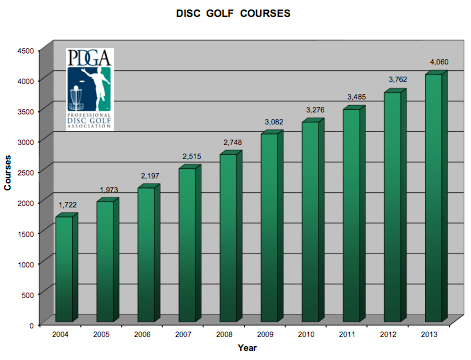 As you can see in the graph below, the total number of disc golf courses has more than doubled in the last decade. The PDGA is the governing body of disc golf, setting standards for discs, baskets, and creating a set of accepted rules for disc golf tournaments. Players who join the PDGA are officially registered and ranked among other disc golf players based on their performance in PDGA sanctioned tournaments. The number of players who consider themselves competitive enough, or who at least take the game seriously enough to register, has grown significantly over the last few years. In 2006 there were 11,302 players registered with the PDGA. In 2016 that number has more than tripled to more than 35,000 active members. Aside from those PDGA membership numbers, there are many more casual or recreational players who enjoy disc golf without even considering any kind of registration or official status. They simply love to play the game. As these trends continue and the number of disc golfers grows, so will the demand for additional disc golf courses, especially those capable of hosting tournaments. One of the fastest growing aspects of disc golf is competitive tournament play. The desire to improve one’s skills and compete for cash and prizes has increased demand for disc golf tournaments, especially over the last three years. 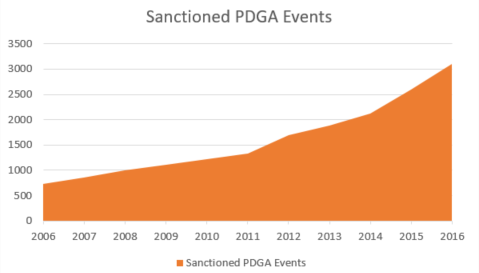 In 2016 alone there were 3,105 PDGA sanctioned tournaments, an increase of 19.8% from 2015. For every PDGA sanctioned tournament, there are many more tournaments that are independently run without the PDGA. Many of these non sanctioned events are single day tournaments and charity fundraisers. In addition, most of the major disc manufacturers run promotional events that cater to casual players. For example, Discraft is a manufacturer that sponsors annual events in many locations called the “Ace Race.” It is designed and promoted for all ages. In 2016, there were 310 Ace Race tournaments held on different courses! And nearly every major disc manufacturer has similar event programs to promote their brand. These events include the Vibram Birdie Bash, Trilogy Challenge, Legacy Ace Run, MVP Circuit, and Prodigy Par 2 Challenge. With so many players taking up the game, and so many tournaments, clinics, and other disc golf events, more courses are needed! One of the biggest limitations on disc golf tournaments is the number of available “championship level” courses. Because many courses are held on multi-use public land, it isn’t possible to reserve many venues for exclusive disc golf tournament play. Disc golf tournaments can have a very positive influence on a community. The recent rapid growth of disc golf has contributed to an increase of national exposure. It has earned increasing amounts of coverage on ESPN’s SportsCenter–3 times in 2015, and 9 times in 2016. SB Nation wrote an article in 2016 mentioning that disc golf was ‘saving the sports highlights,’ sparking interest of viewers that are tired of baseball plays dominating the replays.